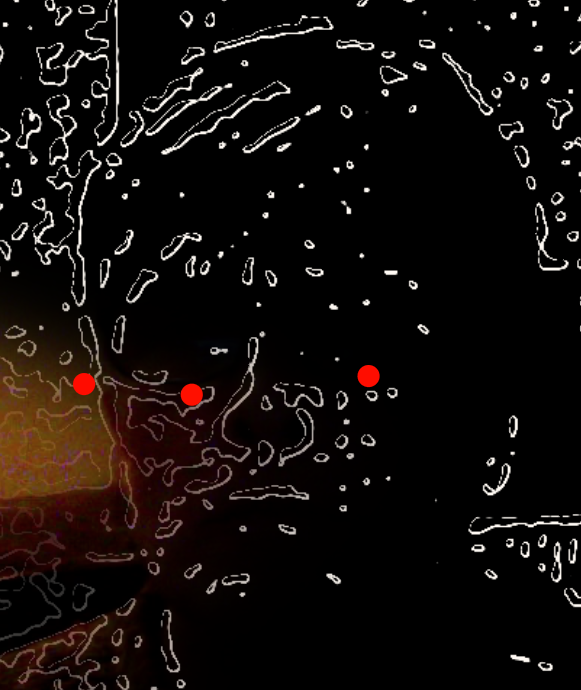 This is a test application that allows one to set 4 (or more) points, using trackpad or mouse, that define an "intelligent", motion tracking, dissolve region, 2 finger (or secondary) click for a reset of the points. The concept is that one can have a video feed, or picture, and intelligently select regions that one wants to have effected by various CI filters. This is a basic implementation. Let me know if anyone runs into any trouble with it - It should work fine in Leopard or Snow Leopard. Worked fine first time then on a second run kept the click instantiated dots but no amendment to CI proc. Can take a while to get into the 'clearer' image filter option. A third time it loaded very quickly indeed. At no time did the dots clear, though that's probably down to the use of a 'Mighty Mouse'. Looks a very interesting idea. Is it meant to not take more than 4 input dots? It seems to take no end of click dots. You have to put two fingers on the track pad and click to clear points (are you doing that, and it's still not clearing points?... This works like a champ on two laptop systems, in both Leopard and SL for me). Are you doing whatever is the normal "secondary click" maneuver for the Mighty Mouse, when you attempt to clear points? I don't use one, and don't have it available to test with. If it doesn't work, then it might be broken in QC period (but maybe not). You do have to make a basic "square" area; making the points in a clockwise or counter-clockwise manner is best. It is meant to take more than 4 points; I didn't cap it. Four points is the suggestion to do a simple face dissolve area. I am planning on uploading a similar process that is strictly capped at 4 points. To confirm & clarify I did mean that CI proc amendment meant CI filter procedure changing - took much longer to get running on this bit of kit on the 2nd time I started your application. Don't have a track pad, but will try your application some time with a Logitech mouse. I found that all sorts of areas could be clicked into place, within which the CI Filter would work, "square" areas formed by many click dots. I'd gotten an initial notion from my reading of your explanation that the click dot defined area would have more than one CI Filter possible within the defined area. Secondary Click is assignable on the Mighty Mouse , but does not clear the defined area - still this application was made for and tested with trackpads , so no wonder really. 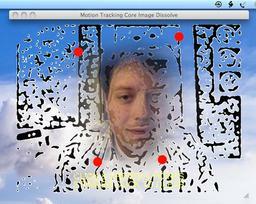 A very interesting idea, the motion tracking & CI Filter works really well. "[11:25:16.463] QCProvider_CoreGraphics: Unable to extract native pixel format from CGImage (bitmap info = 0x00000005 | bits per pixel = 32)"
...yet it doesn't really seem to effect it running well in my testing. Yeah, you can definitely select many regions. In fact, my initial forays into this are more well defined in that way, because the effects I picked could do smaller fade areas. Maybe I'll post that (?). I thought that a simple face mask/single area tailored dissolve was a nice starting point for a public consumption test run. My one reservation is about making the motion tracking part of it, because that part is finicky (as is most motion tracking). As a technique for setting CI area dissolves on still images, it rocks for many scenarios. In a more developed scenario, I can take a video feed and pretty solidly mark over peoples faces or hands, and have various CI effects in the different areas, and it moves around with them.